Sony reveals its Virtual Reality headset. Will its massive base of existing PlayStation users help it leapfrog its rivals? Microsoft's UK research chief Chris Bishop tells us why he thinks artificial intelligence is about the rise of humans rather than the "rise of robots". Plus independent games developer Arran Langmead, whose fortunes we have been following, is invited to showcase his title "Bears Can't Drift?" at the Games Developers Conference in San Francisco. Presented by Rory Cellan-Jones, with Jane Wakefield from the BBC Online tech desk and special guest Thomas Tamblyn, Tech Editor at Huffington Post UK. 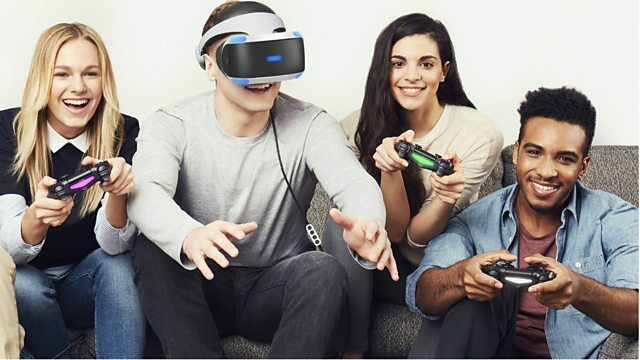 (Picture: Young people on sofa using Sony VR headset, Credit: Sony Computer Entertainment Inc).